which is perfect for this summer's patriotic celebrations. If you have come here from Michelle's Blog, you are on the right path! The blog hop is a great big circle, so you can start here and work your way all around. If you get lost along the way, you’ll find the complete list of participating consultants here . 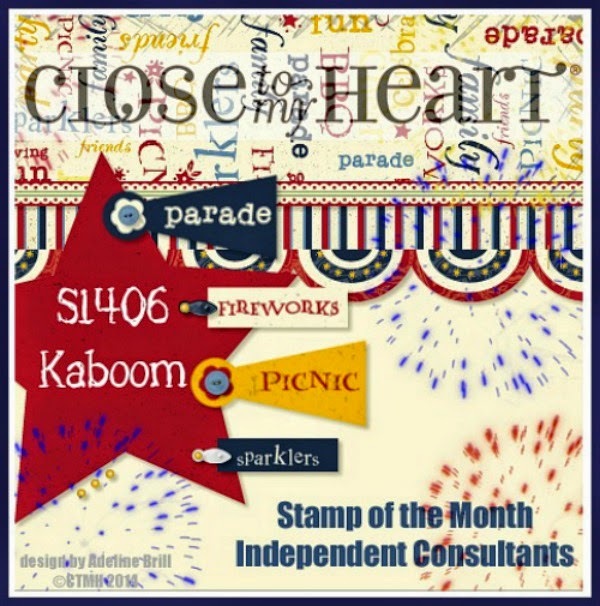 This month we have about 50 Close To My Heart Consultants sharing their creations using this month's SOTM and other great CTMH products on their blogs. This is simple to do - just click on the link at the end of the post on each blog to move to the next one! Here we go! 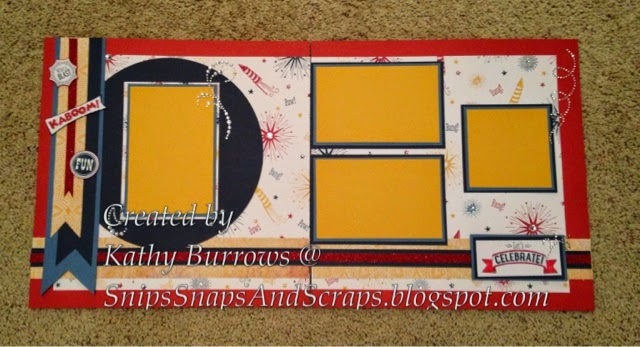 My two page layout is all ready for Fourth of July fun. Cardstock and Ink Colors - Cranberry, Outdoor Denim, Indian Corn Blue. and Honey. The Honey printed paper is from the Jubilee Paper Pack (X7181B). Other accessories - Red Shimmer trim (Z1848), Sparkles Clear Flourishes-small (Z1812), Bitty Sparkles (Z1263), and Clear Assortment Sparkles (Z1752). Now "Hop" on over to Jean's Blog to see what she has created for this hop. 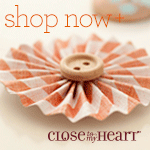 Be sure to visit all the consultants' blogs to get some great crafting ideas! Remember, the June SOTM is only available until June 30th! Contact your CTMH Consultant (or click here) to see how you can get this $17.95 stamp for only $5.00. Yes indeed you are ready! Directions: Just add pictures! Love it! Great layout! All ready to save those new holiday memories! Great job!! Your layout compliments this stamp set so well!!! TFS! !